Used to make molds which capture the finest details and produce smooth, perfect casts. Pliatex molds can be stored indefinitely. Recommended casting materials are gypsum and cement products ONLY. Apply two coats of shellac to entire model cut one to one with alcohol. Divide one-third of model with clay shim. Make key groove along entire length of clay and shellac. Apply Pliatex Separator liberally over dried shellac. Apply five thin coats rubber to one side of clay and inward three inches. Let each coat dry thoroughly. Remove clay, shellac exposed rubber, and apply separator. Apply rubber to the remaining area of model building up 15-30 coats or 1/8”thick. Let mold cure two days to one week. Apply Pliatex Separator liberally over dried rubber. Build plaster mother mold around model and rubber. When finished, open and remove rubber from model. 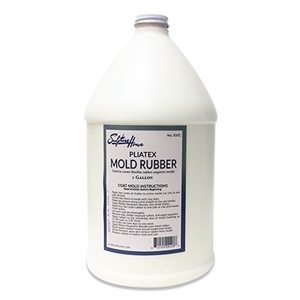 Replace rubber in mother mold and cast.